Most artists I know rely heavily on the work they do in their sketchbooks. By that I mean the sketchbook is a source of inspiration as well as documentation of an artist's mind and ideas. I refer to my sketchbooks on a regular basis and am doodling ideas, testing color families, playing with new supplies, or journaling quick notes in them almost daily. 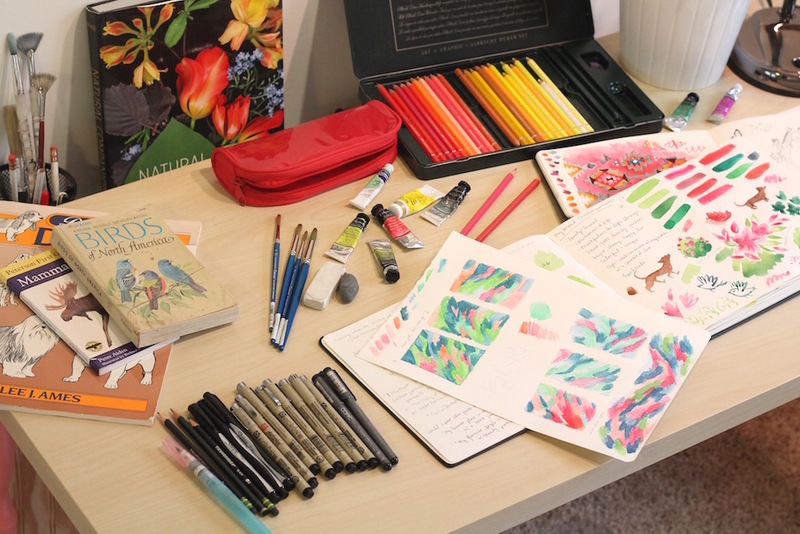 This week I'd like to share a few tips for how to start a watercolor sketchbook. 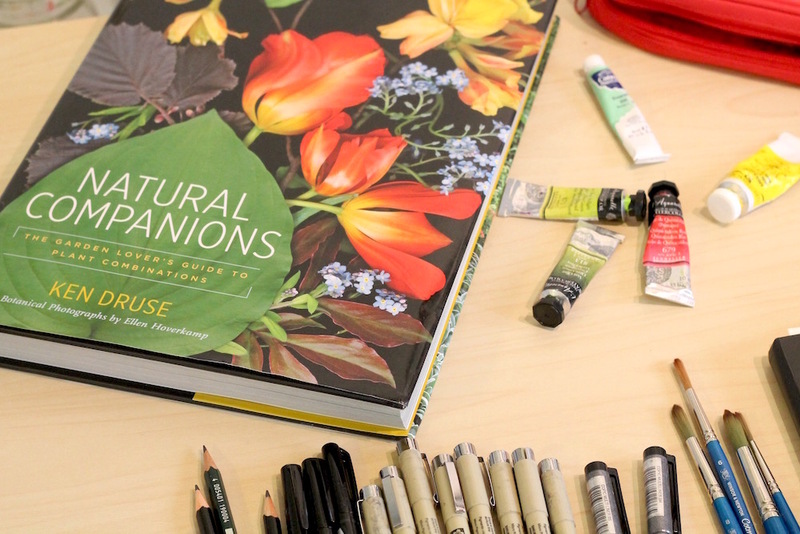 It's a bit more involved than just a regular sketchbook as you'll be incorporating more fun supplies like watercolor colored pencils, brush pens, a travel water brush and more. Watercolor sketching is so much fun! It's like having a private world that's all your own. 1. Find the right supplies. 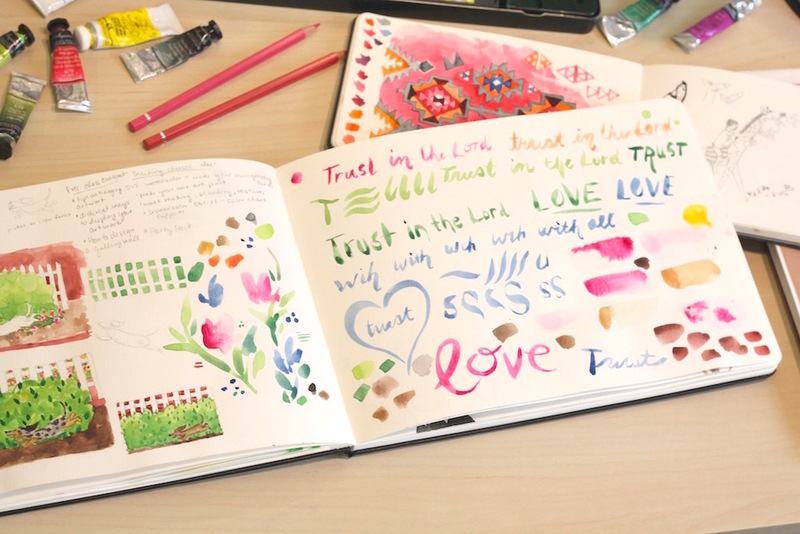 Keeping an active watercolor sketchbook is similar to writing in a journal every day. It can be very relaxing and bring mental clarity. It's all about play and experimentation. As you slowly acquire new tools, use your sketchbook to learn how to use them. This year I saw another artist using brush pens. Her line work was gorgeous and bold, as if she were actually using a real brush and dipping it in ink. When I tracked down her supplies and finally got them in the mail I immediately set out to play with them in my sketchbook. I drew lines, patterns, dots, faces, etc. I'd never even known they existed until I saw someone else using them! I intentionally own sketchbooks of various sizes. The larger Moleskine is for sketching in my studio and around the house. The travel Moleskine is perfect for throwing in my purse with my bag of pencils and brushes as I'm walking out the door. I keep everything very handy and available all the time. Although I don't sketch everywhere I go, just knowing I have the option is enough for me! I might pull out the sketchbook while waiting at the doctor's office or sitting in church. And I love sketching while watching TV! Books are an artist's best friend! 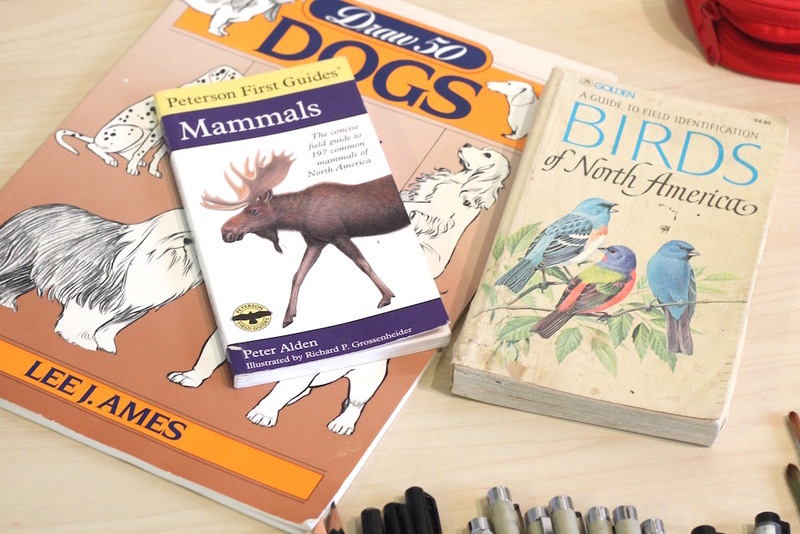 Since I love to draw animals the most, I keep the Peterson First Guide to Mammels, Birds of North America, and Lee Ames' Draw 50 Dogs handy at all times. I also love this Butterflies of the World Fandex and Ken Druse's gorgeous book Natural Companions. You can use anything, really, as a reference. Look for inspiration in magazines, field guides, Pinterest boards, in nature, on your countertops, in your home and yard. Inspiration is all around you if you only have eyes to see! All of the links I provided today would make great stocking stuffers for Christmas! Be sure to find reference materials that speak to you. This fandex looks interesting as well as these field guides.